Avian Tendencies: Apparent intergrade Flicker in Kent Co.
For the past 2 days I have hosted a Northern Flicker at my house which appears to be an intergrade Red-shafted X Yellow-shafted. 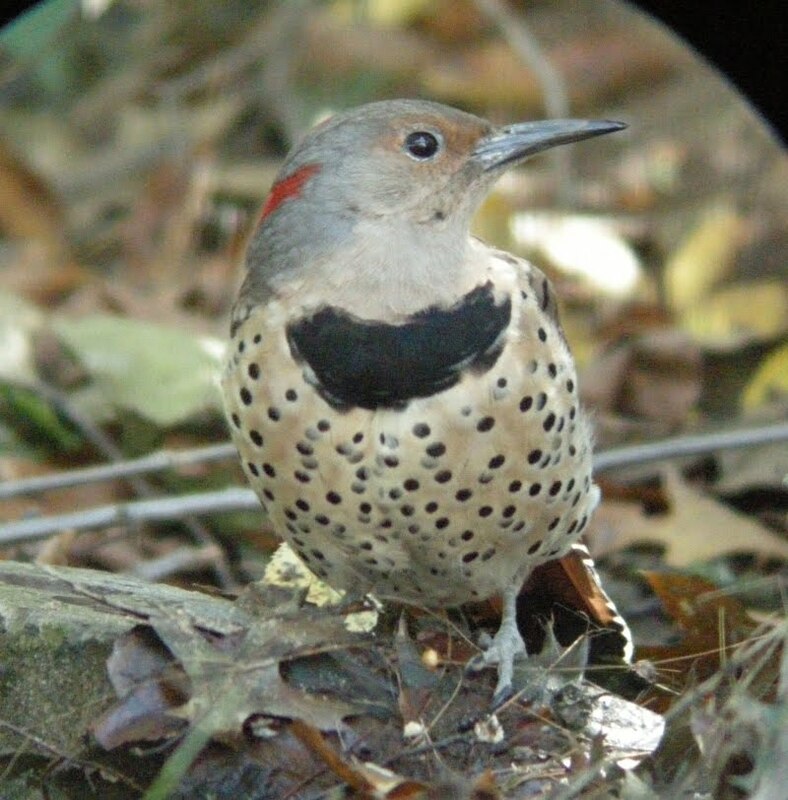 The former subspecies occurs in the American west, while the latter is found in the east, with a fairly narrow band of intergradation in the Great Plains states. 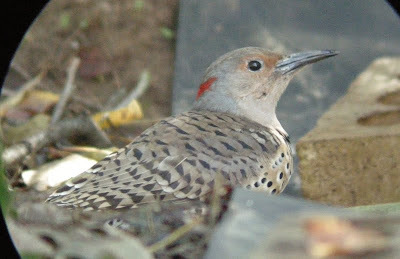 I have not hears of any records of Red-shafted Northern Flickers in Michigan, nor of any intergrades, and would appreciate knowing of any such records. 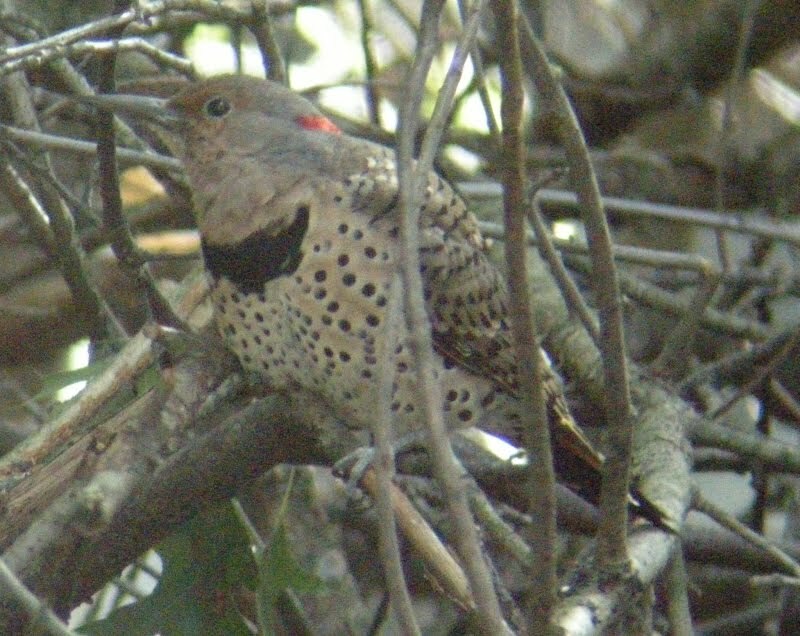 This photo shows the gray of the nape invading at least the back of the auricular, rather than the typical all-brown auricular sharply demarcated at its rear by the nape typical of Yellow-shafteds. Here you can make out the red/orange inner webs of the rectrices, all of which appeared to share this coloration. 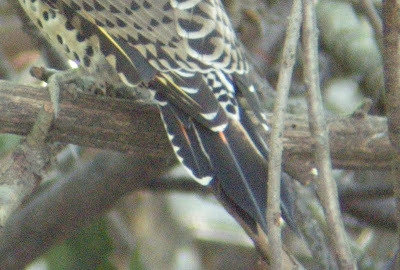 It was difficult to make out the exact shade of these feathers, but whether it is orange or reddish, it stands out very obviously against the yellow webs of the inner primaries and secondaries. Here you can see the obviously reddish/orangish rachis of the rectrices, and how it contrasted to the yellow shafts of one secondary and some of the primaries. I was unable to photograph the outer primary shafts, but I saw them clearly several times and at least 1-2 of the outer primaries had a coloration similar to that shown here on the rectrix rachises. As always, thoughts on the provenance of this bird are solicited. Can a "pure" Yellow-shafted ever show this coloration on any of its flight feathers? There's a link at the bottom of the page to a paper I wrote for MBNH that includes a thorough history of records in Michigan.